Ice caves are natural phenomena that are formed in glaciers during winter. 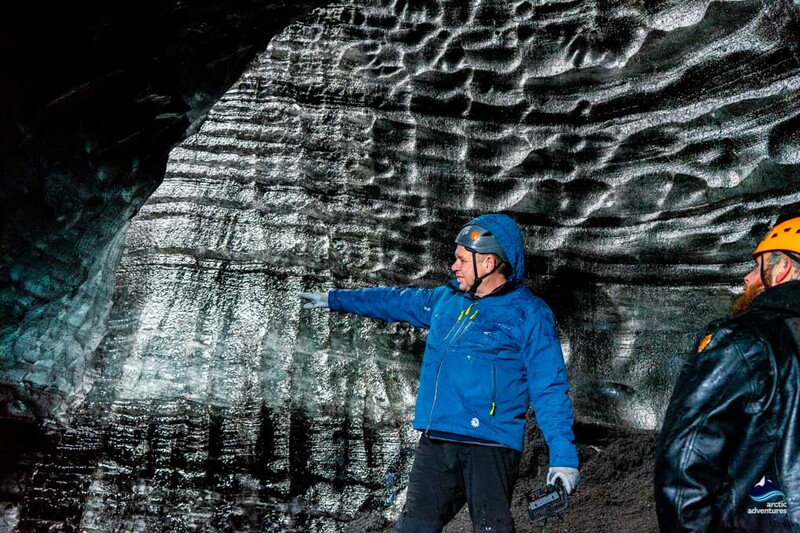 Most often they are formed by water running through or under the glacier and new caves are formed every year. 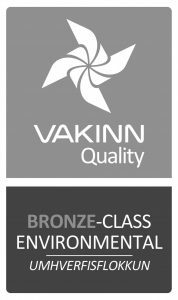 We offer tours to two kinds of Ice caves – a naturally formed cave in Vatnajökull glacier and a man-made cave in Langjökull glacier. 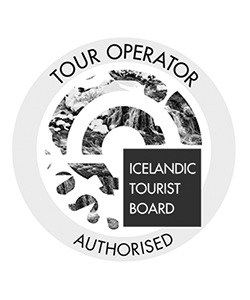 Glacier snowmobiling on Langjökul Glacier & tour into a stunning Ice Cave with pick up from Gullfoss Café. Really enjoy the glacier with thrilling snowmobiling and the added wonder of a visit to a natural Langjökull Ice Cave! 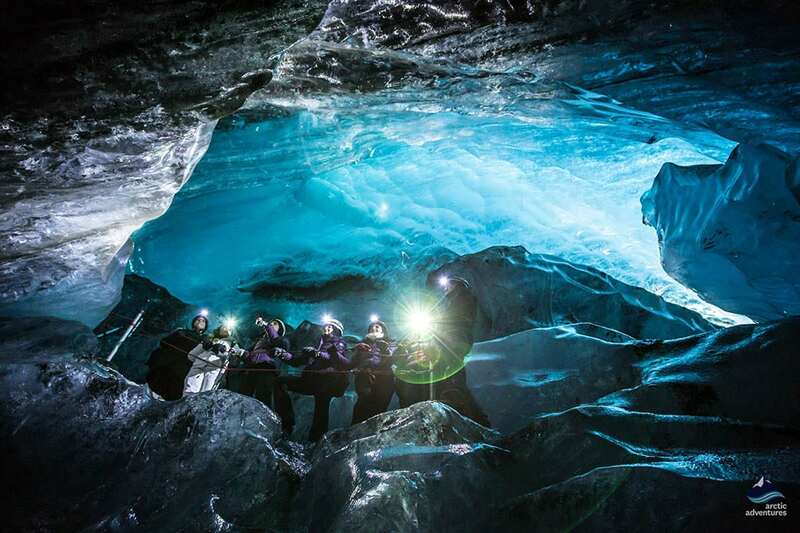 Explore a stunning crystal ice cave in Europe's largest glacier Vatnajökull. 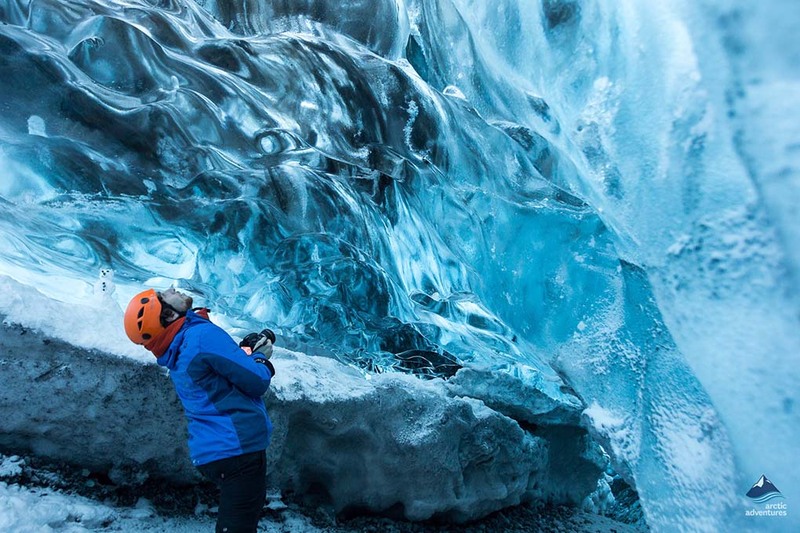 Ride a snowmobile on Langjökull Glacier and visit a totally breath-taking natural Langjökull ice cave on this amazing day tour from Reykjavik. Iceland is truly an ice cave paradise! 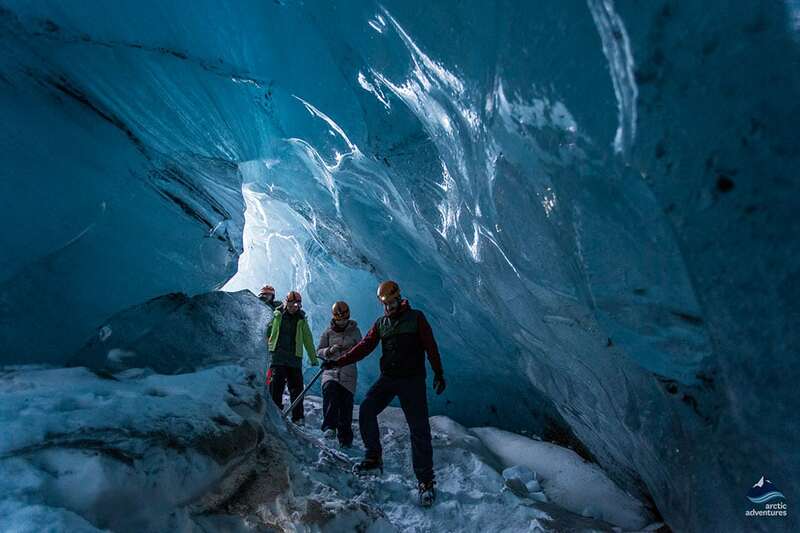 With all its glaciers and ice formations, there is no shortage of natural ice caves and their blue ice roofs make the scene mesmerizing and extremely photogenic, to say the least. There are a few different ice caves that have been visited in recent years and we will talk about each one to explain the difference and the uniqueness about each and every ice cave. 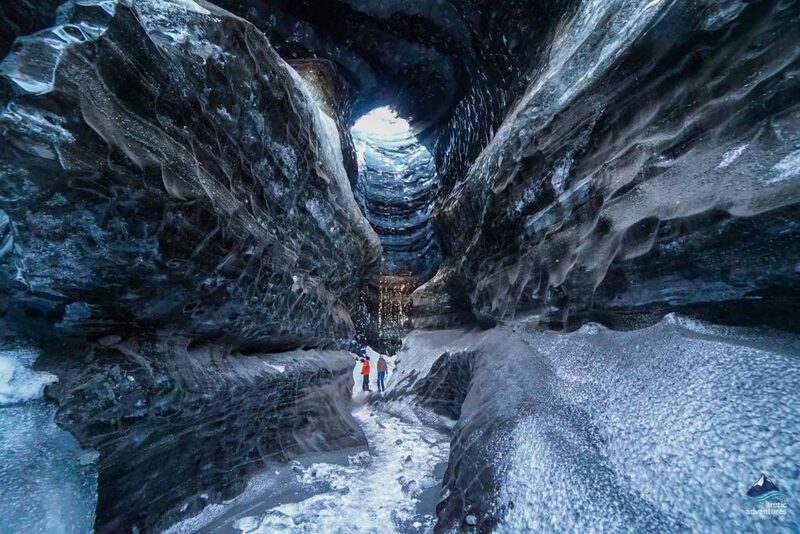 Most of them can be visited by joining day tours and like the glaciers themselves, the majority of the ice caves are found in the South of Iceland. Visiting a natural Ice Cave is truly a once in a lifetime experience especially now that the glaciers are melting due to climate change and the time frame to visit one is getting smaller. The feeling of standing inside a living glacier is hard to beat and the colors and the history that sits in the glacial layers is remarkable! 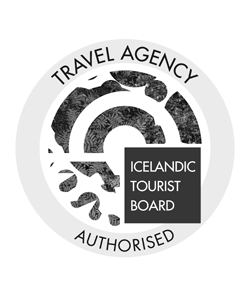 Iceland is known as the land of Ice and Fire due to its glaciers and volcanoes. Glaciers cover about 11% of the total surface of the island and have a great impact on nature, landscapes and living in Iceland. Icelanders have lived in harmony with glaciers from the time they settled and have always both admired and been afraid of their powerful ways. 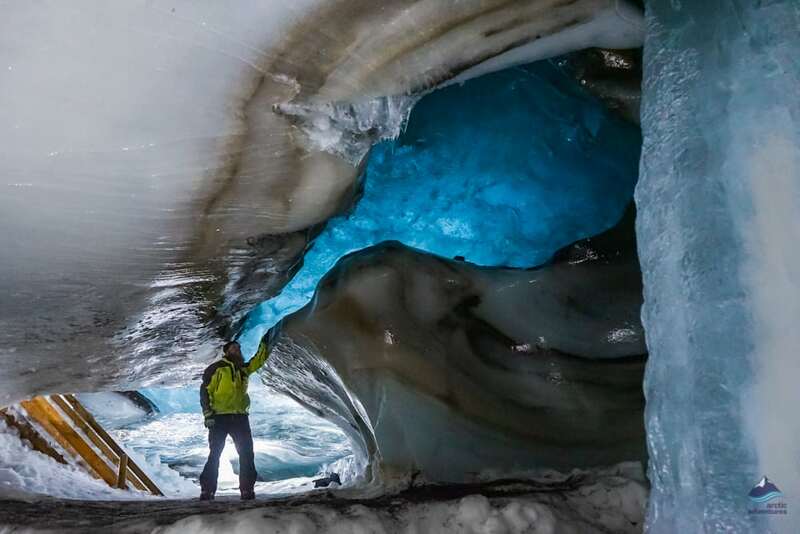 The glaciers and the glacier tongues that crawl down from them have incredible natural beauty and in this article, we will try to give you the best idea on their many and stunning Ice Caves. The Ice Cave Glaciers are Langjökull, Kötlujökull outlet from Mýrdalsjökull, Breiðamerkurjökull and Falljökull outlet glaciers from Vatnajökull. How do Ice Caves form? 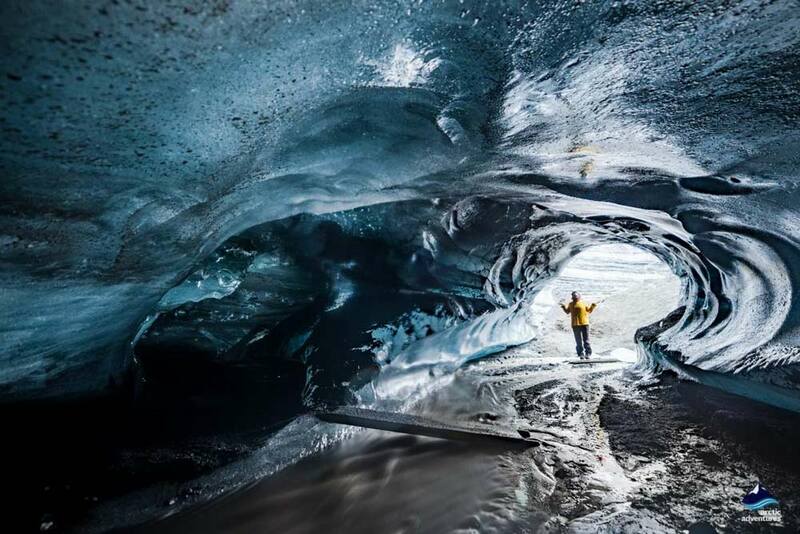 Ice Caves or Ice Tunnels are formed when meltwater, or as happens mostly in Iceland, geothermal heat melts the glacial ice. The glaciers then move, making their way further down and when that happens a hollow space is often created. 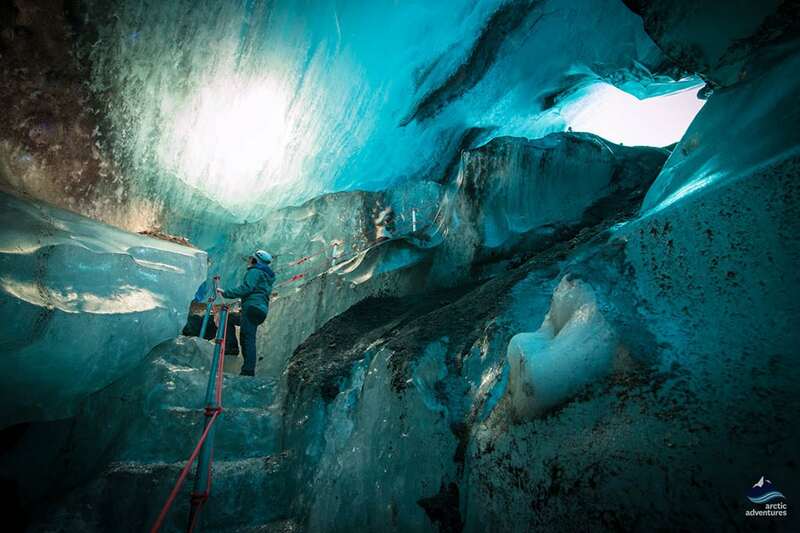 This is how an ice cave forms and is therefore often found at the foot of the glacier. The constant movement and melting of the glaciers lead to the ice caves to constantly change as well. They can look completely different depending on the season or sometimes even months. 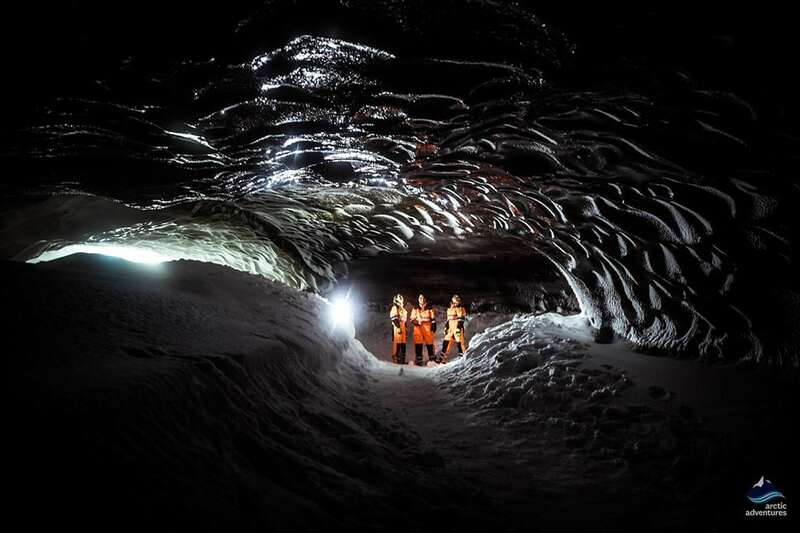 This is why people often join the same Ice Cave Tour a few times if visiting Iceland again. 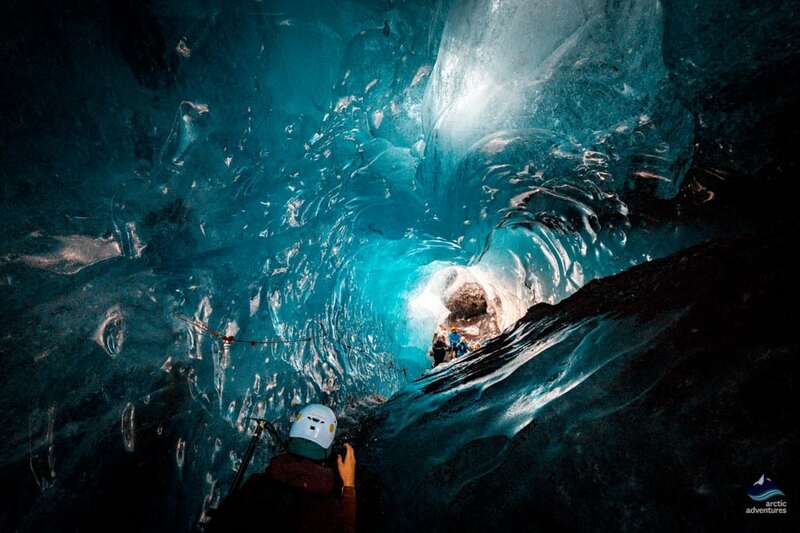 Vatnajökull is Europe’s largest ice caves and covers about 8% off Iceland’s surface. This voluminous glacial wonderland sits in the Midlands and South and South East part of Iceland and its outlet glaciers stretch well down to Ring Road one in the South. The meltwater from a glacier this size is unbelievable and with the climate change and movement of the glacier, more and more ice caves have been forming in the area. 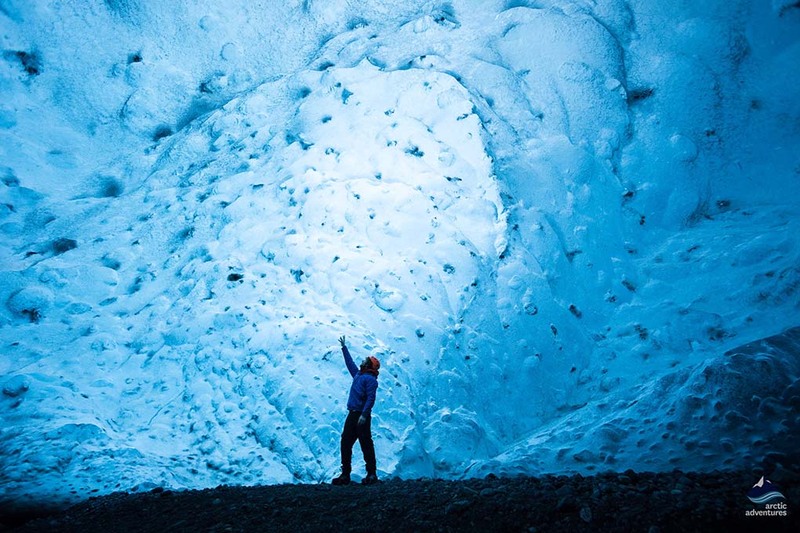 The most famous and popular ice caves are on Vatnajökull’s outlet glaciers Falljökull and Breiðamerkurjökull. 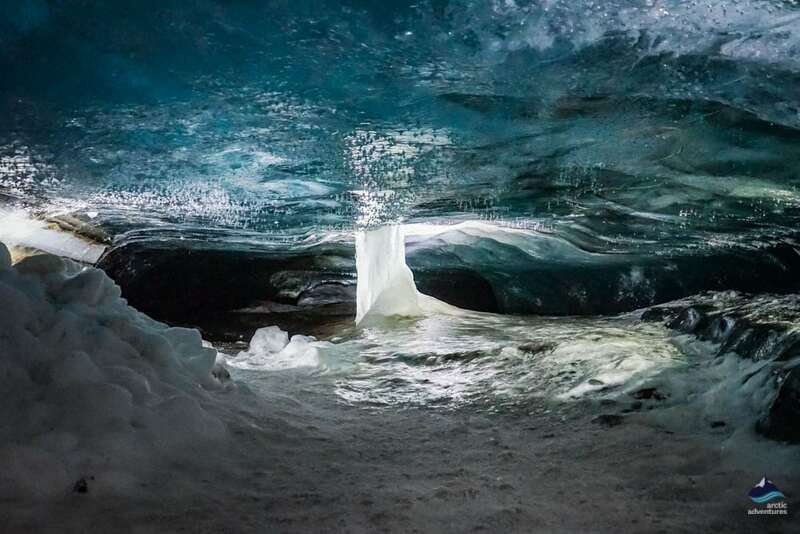 Falljökull has new ice caves and tunnels appearing but the Breiðamerkurjökull glacier has the Crystal Ice Cave. The Crystal Ice Cave is very likely the most famous Ice Cave in Iceland, known for its incredibly turquoise blue colors. It is located in Breiðamerkurjökull an outlet glacier from Vatnajökull, the biggest ice cap in Europe and the same glacier as feeds the famous Jökulsárlón Glacier Lagoon. It is very likely the glacier Ice Cave you saw a photo of when you first saw a still from an Ice Cave in Iceland. This Ice Cave sits at the bottom of the glacier which gives it pros and cons. The pros are that the ice roof is very thin making it easy for light to shine through creating the most spectacular sight of blue ice but this also means that it is more weather dependent. For this cave, we hope for a cold but bright day giving you the most extraordinary experience and a memory you will surely not forget. Note: This tour gets sold out quickly as only a certain amount of visitors are allowed at each time to make sure you have plenty of space to move around and admire the cave. This is why booking well in advance is advisable. This is the Original Into the Glacier Tour. 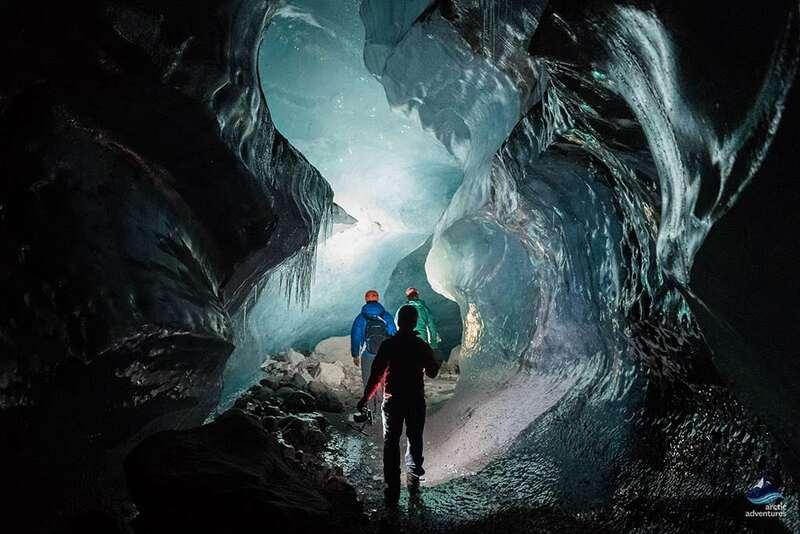 It is a glacier hiking and ice cave exploring adventure operated on the Falljökull Glacier an outlet glacier from Vatnajökull, Europe’s largest ice cap. This glacier ice cave or ice tunnel as some parts of the roof often melt open is an intensely beautiful ice cave that has been a winter attraction in the Skaftafell National Park area for some years now. The Ice cave isn’t always the same but the glacier hasn’t failed us yet creating one wonderment after another to amaze anyone who visits. 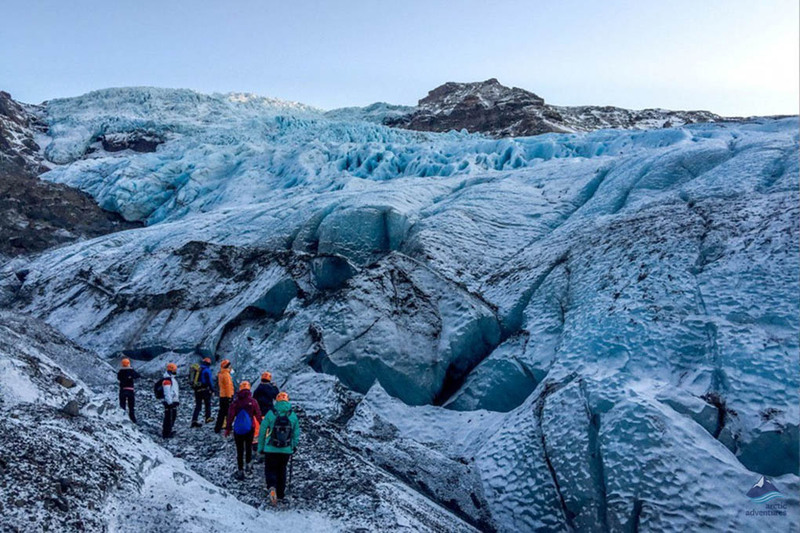 This is the perfect tour for those who want to hike a glacier and also visit an ice cave: The Ultimate Glacier Combo for Winter travelers coming to the Skaftafell region. 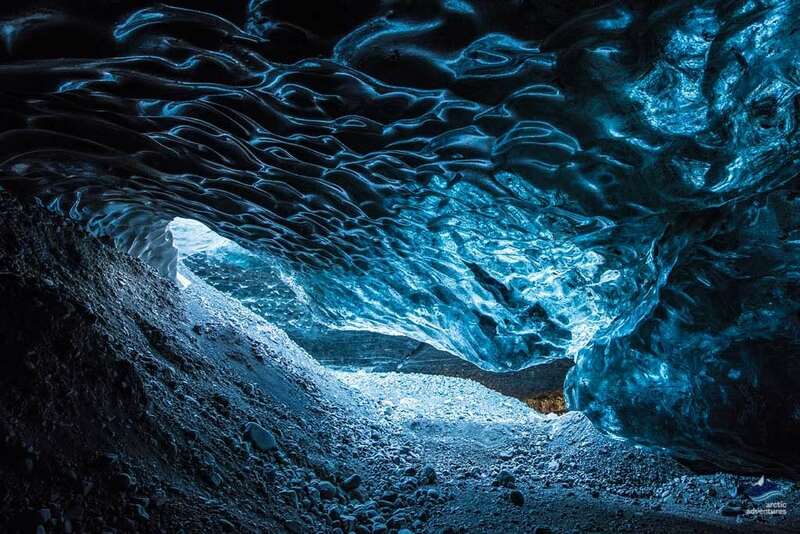 This Ice Cave is found in an outlet glacier from Mýrdalsjökull ice cap called Kötlujökull and is named after the famous and active volcano Katla. that lives inside the glacier. The Ice Cave is a relatively new one but it is truly magnificent and unique. The landscape driving up to the glacier is extremely rough so you will need to join a tour from Reykjavík or Vík to get the proper ride needed to access. The area surrounding the glacier opening was used to film for Star Wars: Rogue One and is known to be extremely moon-like and beautiful. The walk to the glacier is a short one and but you will need proper glacier gear as no chances should be taken when entering an ice cave. This gear is offered by the tour companies offering trips to the Ice Cave adding yet another reason to why people should not try to explore Ice Cave on their own. 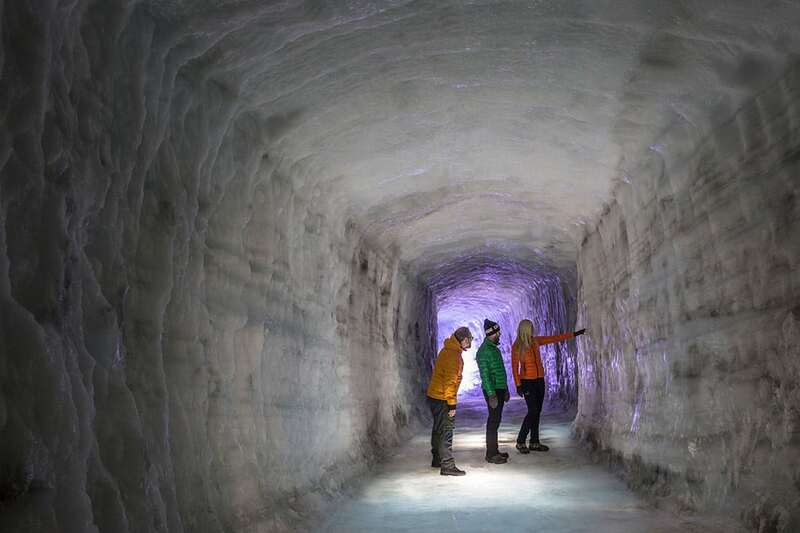 First you will walk through a quite narrow snake-shaped ice tunnel and then you will get into the Ice Cave’s “dome” where an opening has formed in the ceiling making the feeling of standing there like visiting an enormous glacier cathedral! 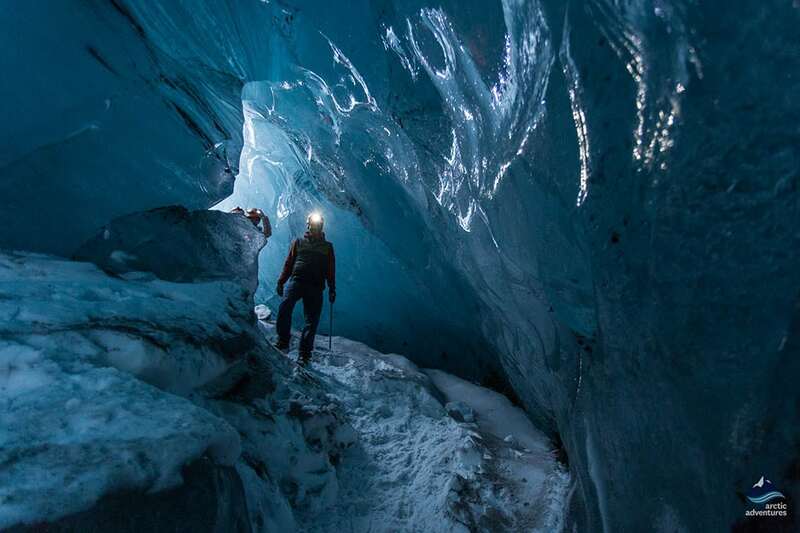 Early in the 2018 season, another opening was found to a second ice cave located inside the first one. 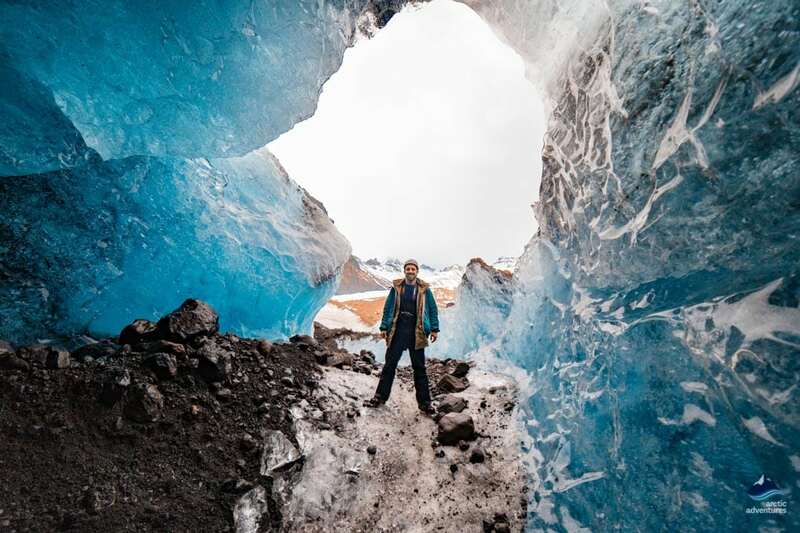 This added even more excitement to the experience of visiting the glacier under the volcano as if visiting an ice cave inside a glacier right underneath the volcano Katla wasn’t adventurous enough! 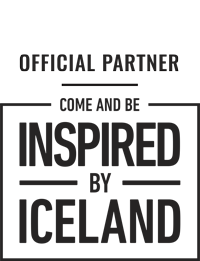 This truly is one of the most unique experiences one can have! 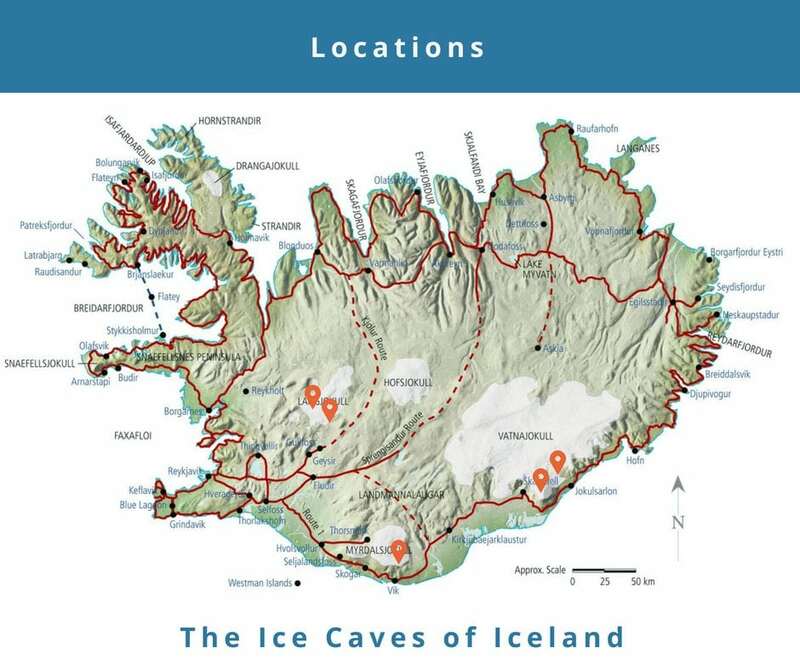 This is the only natural Ice Cave that you can visit from Reykjavik or Vík that will be available well into the Summer Season. 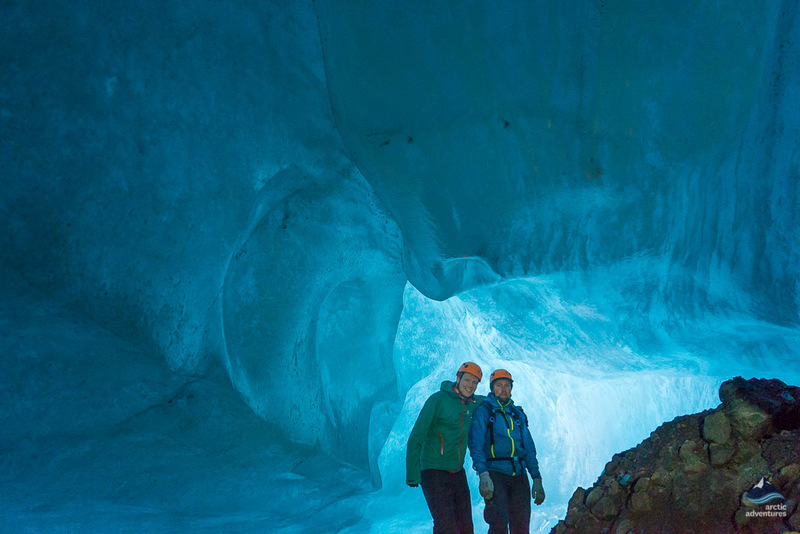 This Ice Caving Adventure is one of the most popular tours Arctic Adventures offers. Langjökul is Iceland’s second largest glacier after Vatnajökull glacier. It is located in the West Midlands and is shaped similar to an upside down Africa. The glacier feeds the waterfalls Gullfoss, Hraunfossar and Barnafoss and the views from Langjökull are awesome! 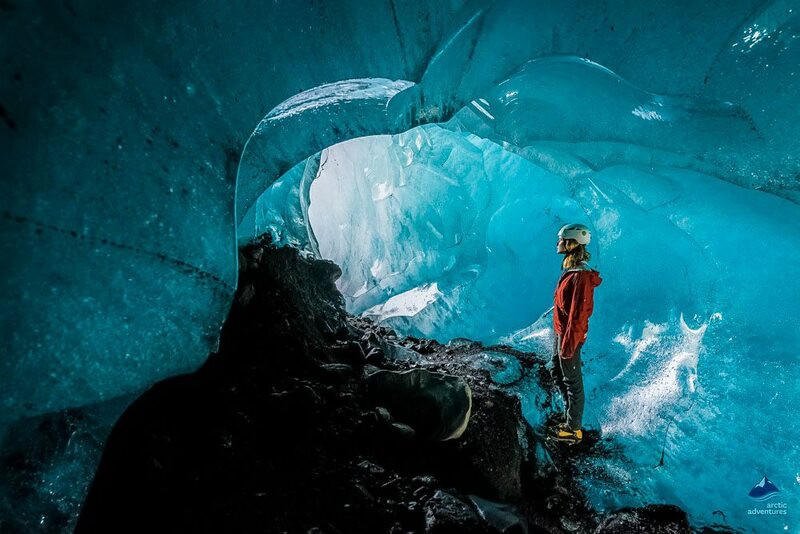 Langjökull has a Man-Made Ice Tunnel created only a few years ago and then at the other side of the glacier unimaginably beautiful natural ice caves have formed in the last two years. 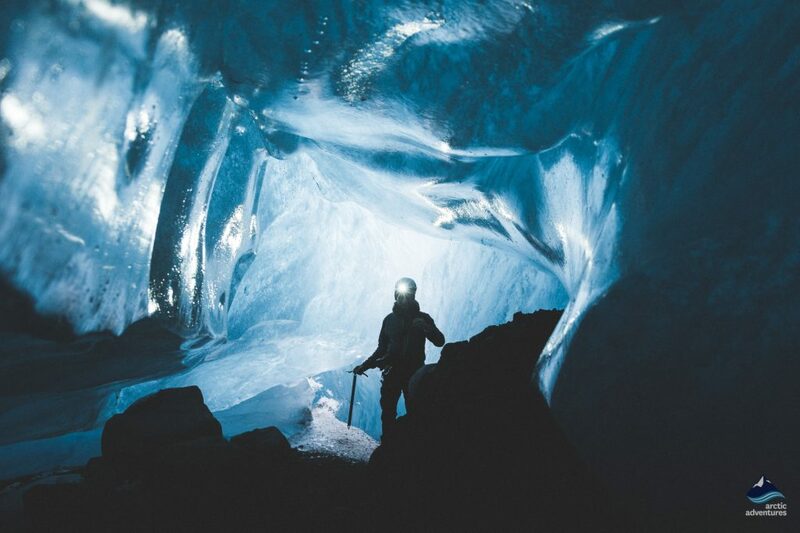 The natural Ice Cave can be visited on snowmobiling or Super Jeep Tours from Gullfoss waterfall right off the Golden Circle or Reyjavík and the Man Made one of a Super Truck Tour to from Húsafell or Reykjavík. The terrain is like another planet while you make your way from Húsafell towards the camp. Once up there you will move to a huge Monster Truck that will take you to the opening of the Ice Tunnel there you are provided with crampons and in you go to explore the stunning glacier from the inside. You will see the layers of the glacier and get a history lesson in why and what made these lines form. 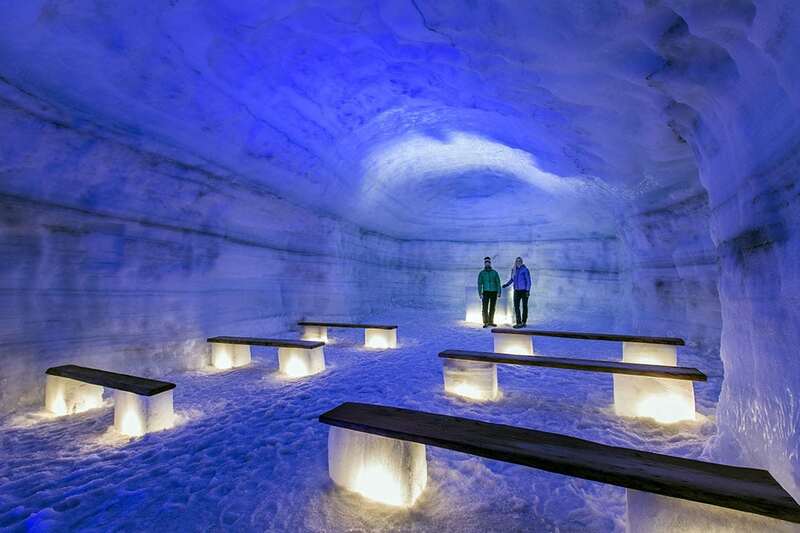 There is a chapel inside the glacier and already have people married in there! There are cracks in the cave so you can see even better into the glaciers core and there will be plenty of moments to snap some great pictures. Creating this ice tunnel took a lot of planning, enthusiasm and drive but with the right people it was possible and now you can visit! 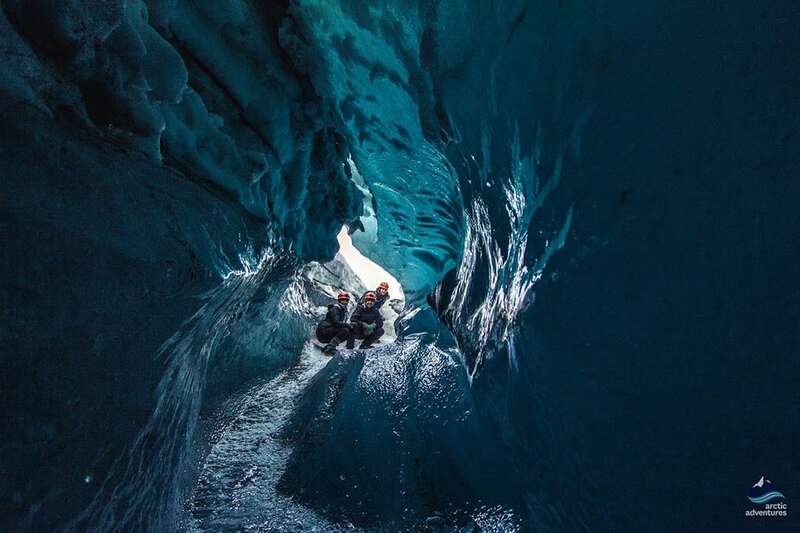 The natural ice caves of Langjökull are as different as they are many. The one found in the season of 2016-17 was incredibly beautiful but the ice was very thick so it was no one of those blue ice caves you often see pictures off. Instead, the cave was glistening like a diamond all around and the silence inside was without comparison. 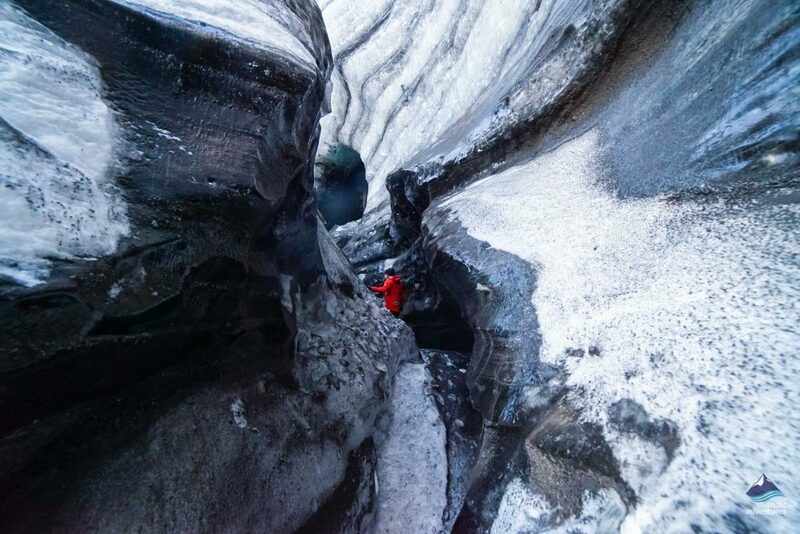 It was quite a magical moment to slide into the ice cave as it was only accessible through a natural glacier chute. This cave, unfortunately, didn’t last very long and in the winter of 2017-18, the cave wasn’t safe anymore. Thankfully nature granted us with another cave and this time it was even more beautiful. 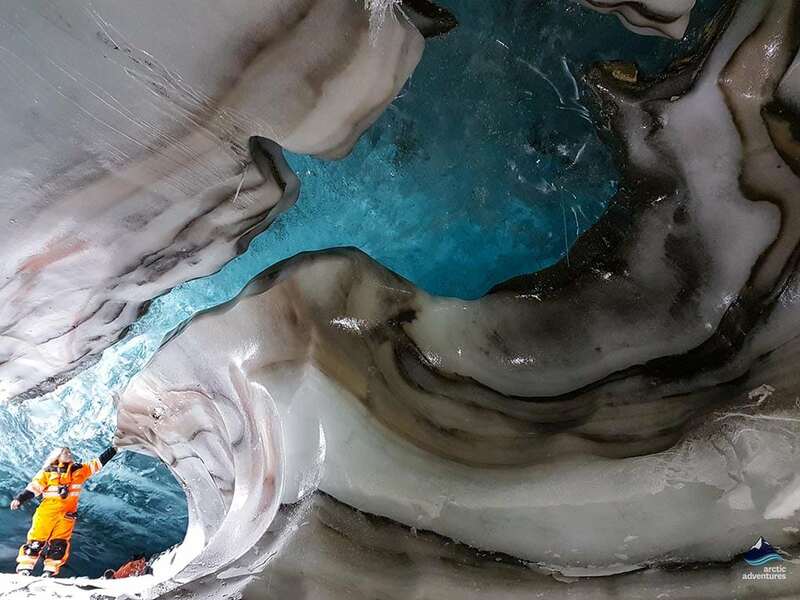 This glacier ice cave has a sapphire blue ceiling and intense colors that tell the rich history of the volcanic systems that sit within the glacier. When entering the glacier ice cave you will have an option of going left or right. Left will take you into the narrow part of the glacier where small frozen poles seem like they are holding up the glacier roof and beautiful aqua colors mix with snow or right where there is a large hole you can step into. This is where you can stand up and really get to admire the glacier and its form. The “frozen river” in the ceiling is the widest in this part and during the coldest winter months a frozen waterfall formed in the right wing. You will likely need to slide yourself down to explore this part but getting up is easy so you will not have to worry at all! This Ice Cave can be visited during a snowmobiling tour across Langjökull or in a Super Jeep tour. Both are available as day tours from Reykjavík. 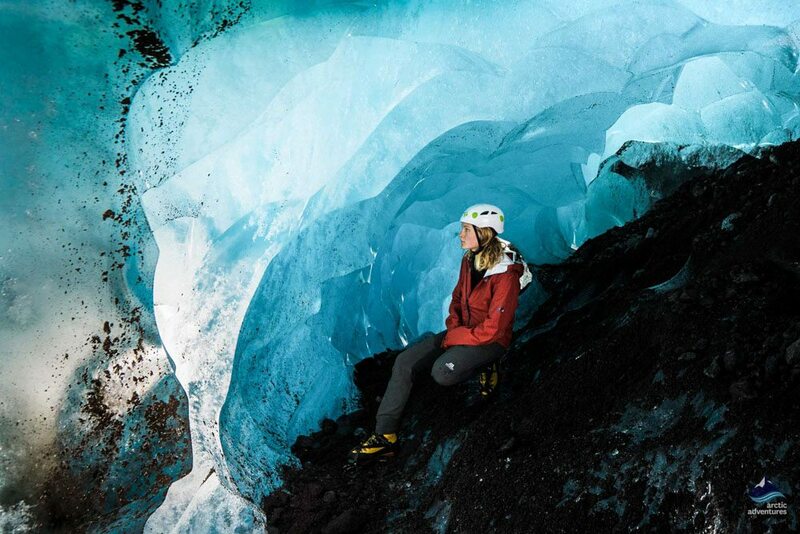 Dressing for an Ice Cave Adventure in Iceland Summer or Winter will always have to be warm. You are after all entering a glacier, no matter the season. Thermal underwear is advised, the next layer some outdoor pants (preferably waterproof) and then a sweater before putting on a coat or waterproof jacket. Hats, buff or scarf and gloves are necessary for the cold climate. Sunglasses can also come in handy! Odds are that if you are looking to take an Ice Cave photo to post on your Instagram you will join a tour to take you to one and that will help a lot since many of the guides are excellent in ice cave photography, with ice caves being their passion, and can help you with your camera. You are going to need to bring a tripod, extra batteries (the cold will drain out your battery faster) and of course the proper safety gear for exploring ice caves. Wide angle lenses with a fast aperture are the best as they capture the cave a whole and you won’t have to scale the focus down or put the photo together afterward. If you are going this on your phone it is best to stand in the opening of the cave and if you are traveling with someone, have them shine a light at the ice to show its colors. This can create a magical feel to the photo and really capture the colors and light in the best way you can using your phone. Another option is to use the light coming in from the opening of the cave and taking the photos from the deepest point of the cave. The most important factor is to take your time, go around, try the light settings on your phone, maybe even try using the flashlight and play with the angles!